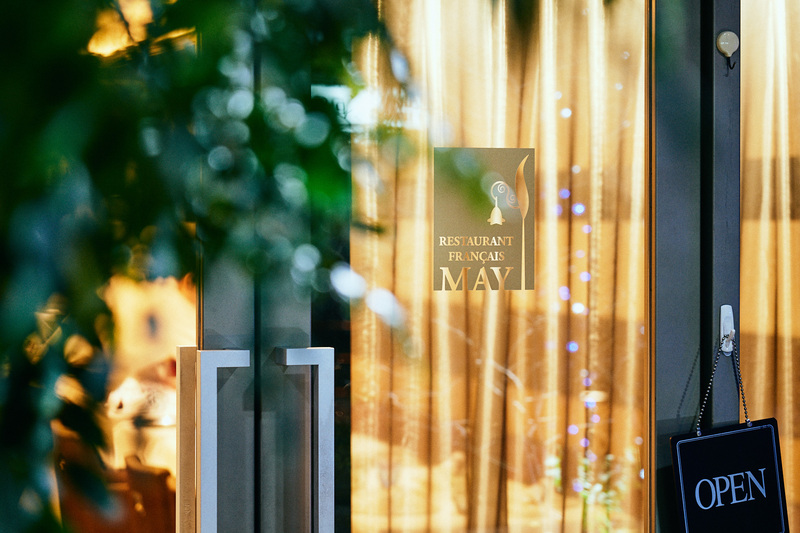 If you live in Tokyo and love French food, you might feel a touch awkward to hear that Restaurant May is located in Gotanda - sometimes considered something of a seedy, sleazier part of town. Fortunately, Restauran May is in a newly developed, clean area a mere five minute walk from the station. What makes Restaurant May unique among French restaurants in Tokyo is the way they serve two main dishes cooked with the same meat. This approach means you can taste the best of both worlds - where one dish has the aura of traditional French cuisine, the other is cooked light, with modern sophistication. The other dishes, too, are finely constructed. This exquisite preparation starts with the ingredients. Even before you finish your first appetizer, you’ll notice that owner-chef Mitsuhiro Iwata is very careful with ingredient selection, and cooks them all with respect. Chef Iwata has a unique background. Though he grew up in a blue collar family, there was a great passion for food - his father grew fruits and vegetables in Odawara, and his mother enjoyed using these ingredients in her cooking. Chef Iwata’s mother was a fan of making things herself, instead of buying them at grocery stores, and he still remembers his mother making dishes with béchamel sauce, a common sauce in French cuisine. Chef Iwata has fond memories of wanting to become a cook whilst still a kindergartener. But even with those dreams in place, it was a long road to owning and running his own French restaurant. Having dedicated himself to running for the track team during his high school years, Iwata joined Fujiya Hotel which has a longer tradition than the Imperial Hotel, in Hakone, where he learnt the basics of cooking for six years. After that, he decided to move to Tokyo and devote himself to French cuisine. After working for two French restaurants in the Tokyo area, Iwata gained the chance to work for Mona Lisa, in Marunouchi. At Mona Lisa, he at first had a hard time understanding French culinary terminologies, but managed to survive his first year in a very demanding French kitchen. 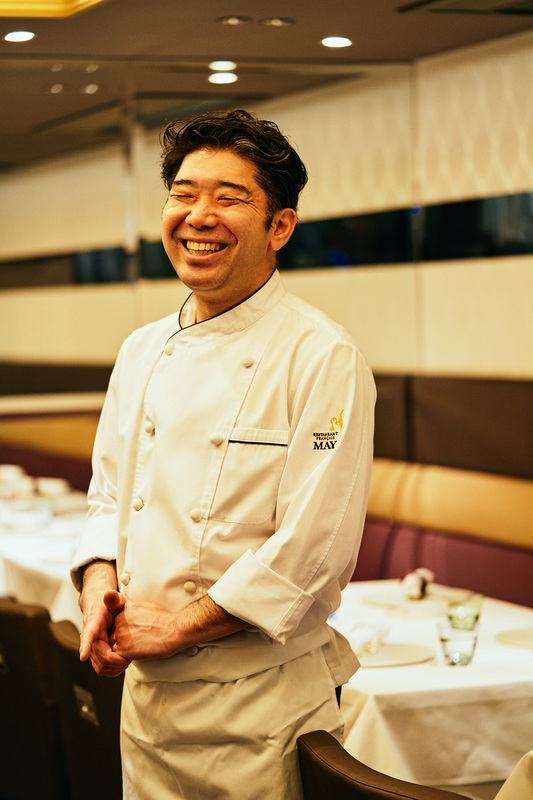 He was soon transferred to Mona Lisa’s main restaurant, in Ebisu, where it took four years to become sous-chef. At thirty, Iwata awarded himself a birthday present of a trip to Paris, though one week felt too short - even though Iwata ate four times a day while he was there! Upon returning to Japan, Iwata began learning French, eventually acquiring a one-year working holiday visa and heading back to France - his mission being to work to eat, or eat to work. He spent his first six months learning gastronomy at Michelin double starred Le Grand Véfour, and with the remainder of his time he worked for Le Repaire de Cartouche, learning traditional French cuisine. Upon his return to Tokyo, he was welcomed back to Mona Lisa as their new chef. At Restaurant May, opened in May of 2014, you can taste Chef Iwata’s dishes - both traditional and modern - as if listening to the songs of your favorite musicians in a greatest hits album. If you are passionate about French cuisine, Restaurant May in Gotanda should be on your list of places to go. You will surely end up even more passionate after tasting the charming polar opposites of French cuisine; classic and modern. All prices indicated above do not include consumption tax. A service charge of 5% and 10% will be added for lunch and dinner, respectively. Restaurant May’s wine list boasts an impressive combined total of more than 80 red and white wines. Though the overwhelming majority are naturally from France, there are a few bottles from the New World, including California and New Zealand. There are also a couple of Japanese wines on the list. White wines start at around 5,000 yen, while red wines start at around 6,000. Champagnes start at around 9,000 yen. Along with Champagne, the sparkling wine Cava, from Spain, and a Japanese sparkling wine is also offered at less than 5,000 yen. The restaurant offers six daily wines - 3 red and 3 white, priced from 1,000 yen. Champagne by the glass is also offered from 1,300 yen.